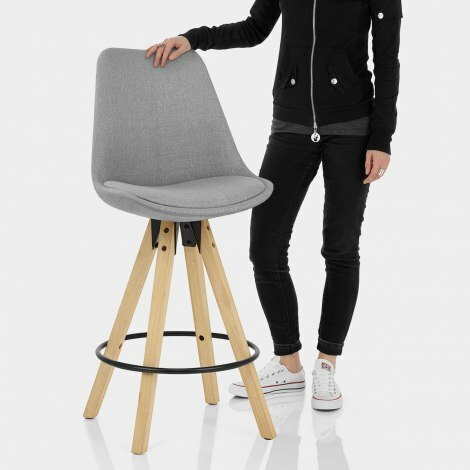 The Aero Bar Stool Grey Fabric is a fantastic fixed height piece, effortlessly fusing Scandi style with retro influences. Providing an elevated chair-like experience at your bar, the curved seat and tall backrest combine with an integrated seat pad for a comfortable feel. The four wooden legs taper out from beneath the seat and are connected by a metallic circular footrest, lending a practical and distinctive frame. Finally, protective plugs are included on the underside to reduce the risk of any marks to your floors, making the Aero an efficient and successfully stylish piece. "A strong, stylish and well made stool"
Aero chairs and bar stools! Bought these chairs and matching bar stools and I am so pleased with them, they are really great sturdy chairs and a great price too. They where easy to assemble arrived within 2 days of ordering well packaged and the plus was they only cost an extra £9.99 to delivery to northern Ireland ! I would definitely recommend this website and these chairs and I would definitely buy from here again! Very happy with our 6 stools for our breakfast bar to complete our new Kitchen. Easy to put together, came securely packaged, free next day delivery. Would recommend. We pondered over these stools for about 4 weeks - we couldn't find anything else anywhere that came close to the style, quality and build of these. They were a little tricky to put together, but nothing majorly difficult. They are sturdy, comfortable and above all look absolutely superb in my new kitchen. Now thinking about the matching dining chairs as we love these stools so much. The chair is as seen in the picture and very happy with the quality for the price. Would buy it again.